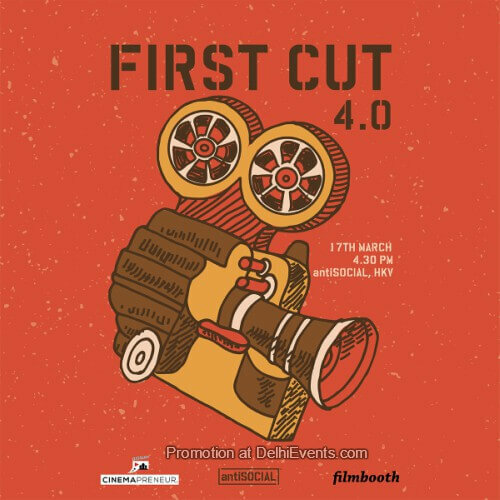 Event Description : FILM TALK "First Cut 4.0"
For film lovers, you get to see some of the earliest work of future filmmakers. Experimental films, in depth-conversations, the breakdown of the process of making the film. Filmmakers present will share their insights of “How to make your first film”, “How to fund your own film”. As a creative professional, you meet fellows from the city from various fields with whom you can network and collaborate for future projects. If you have a project you can also talk about it briefly at the screening. As a filmmaker show your film to an audience which is open to experimental films, understand creative ideas. You can take feedback, share your insights on filmmaking and meet some new artists for collaborations for your future projects.